The ONLY time "running" bamboo presents an issue is because of a lack of proper maintenance. It is like a teenager, they may run away if they are not cared for and understood. Bamboo, like all other life forms, expends energy in an efficient manner. 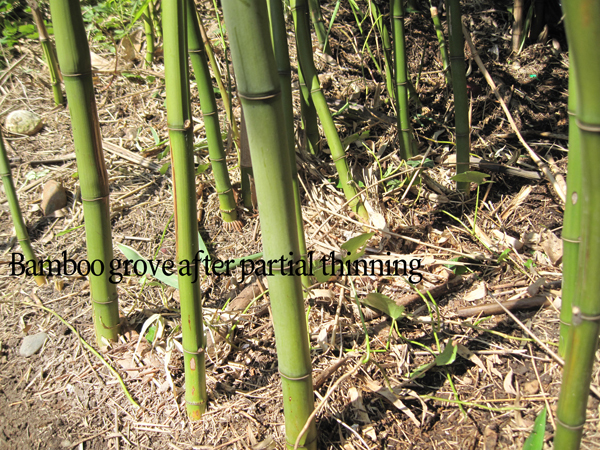 If the bamboo is content in the grove it will expend energy to send up baby shoots through the ground. If it is not content it will send rhizomes to find a new place to establish. We are often asked to remove "invasive" clumping bamboo as well as running. Light. Not necessarily full sun but good light. Moisture. Frequent and deep watering is required. Bare ground below the culms. Yes, your bamboo needs to be thinned. If bamboo does not have all of these elements it may begin to expend energy to move under the ground to a location that does have these elements. Bamboo rhizomes expend energy to push new shoots up through the earth to access sunlight for photosynthesis. 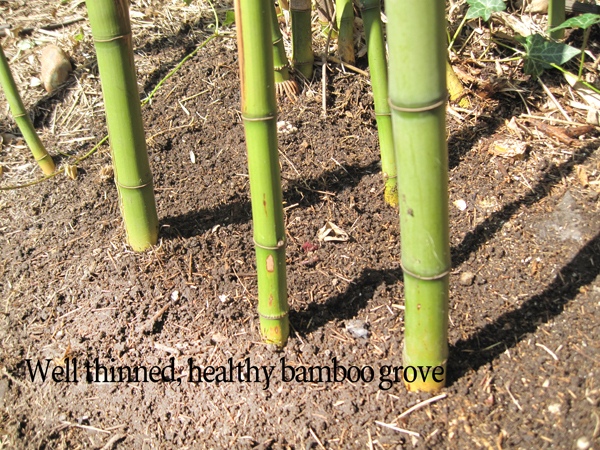 If the bamboo grove is overcrowded the rhizomes will expend energy to find new territory, meaning they will "run" to new areas of your garden, under concrete and asphalt, onto neighboring properties. 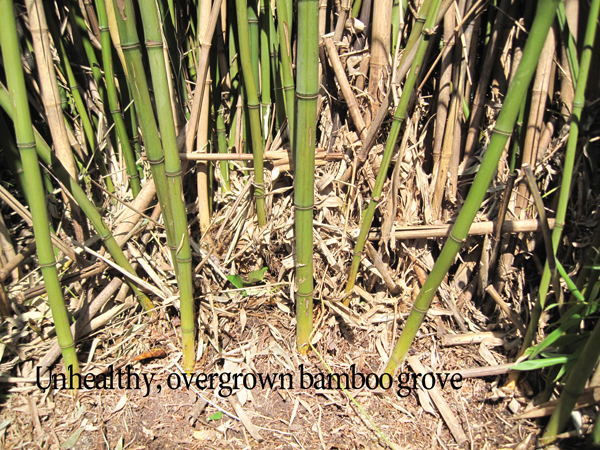 The only bamboo that is "invasive" is bamboo that is not properly and lovingly maintained. Seattle Bamboo is providing the thinnings from your Seattle bamboo groves for the zoo's elephant feeding program. The thinning of your grove can give it the space it needs to propagate without invading your and your neighbor's property and feed the elephants! All of your clean and pesticide free bamboo thinnings and prunings will be delivered to the zoo throughout this spring and summer. Clumping bamboo has rhizomes just like running bamboo and can be just as aggressive and invasive when it is overcrowded, confined, or othewise not happy where it is. About 30% of our removal requests are for overgrown clumping bamboo. We might add that 90% of our total business is removing bamboo from gardens with bamboo planted by "professionals" using a "barrier". 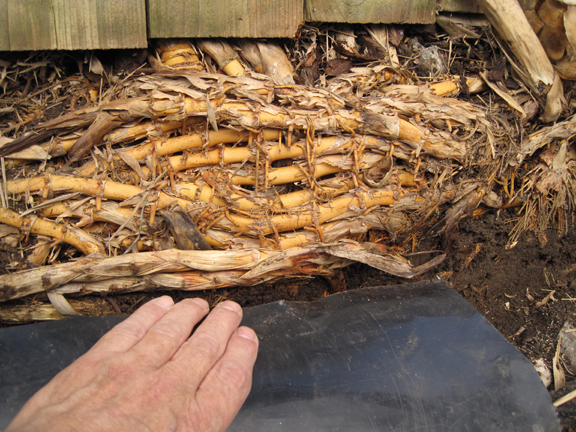 Once the bamboo rhizomes fill the container, the entire mess will become root bound (actually rhizome bound as well) and the bamboo will begin to look unhealthy no matter what you do. The rhizomes do not stop at the barrier as one might be advised, they are deflected by the barrier then circle the barrier looking for a way to escape. Eventually they may go under the barrier sending rhizomes throughout your garden 2-3' under the soil. When a bamboo grove has escaped its barrier, it is usually time to either remove and replace it, or "renegotiate" your relationship with it. If bamboo is happy where it is, there are usually no problems. But once it has become unhappy and begins to try to escape, it is time to think about removing it. We have the tools, the brains, and the brawn to successfully remove problem groves, and we guarantee our work. If a new shoot emerges where we have dug, we remove it for free. Call us at 206.724.1977 for a detailed phone estimate, or we will come out and take a look at the issues you are having. PLEASE NOTE: Overcrowded bamboo will WANT to escape, it will produce very leggy and unhealthy new shoots, and will not replace the old culms with fresh, healthy new growth. Overcrowded bamboo plantings will also create a "root bound" situation the size of the containment area, this is often a very huge problem with existing groves. There are "right" ways to plant and contain bamboo, and there are all the other ways. We have to expertise, the tools, the energy, and the right varieties of bamboo that will work in your garden. If you need a planting consultation we offer that as part of our service or you can plant it yourself and we will deliver it to your site. If you have a grove of bamboo on your property and it has NOT been thinned, you NEED this service. One of the ways to "contain" bamboo is to keep it very happy where you want it. Thinning the grove allows for light to penetrate the canopy, enables new growth to sprout within the grove, and keeps mite and other pest problems to a minimum. PLEASE NOTE: Overcrowded bamboo will WANT to escape, will produce very leggy and unhealthy new shoots, and will not replace the old culms with fresh, healthy new growth. Overcrowded bamboo plantings will also create a "root bound" situation the size of the containment area, this is often a very huge problem with existing groves. It is a good idea to have us look at your grove and determine if you need this service. Our estimates are firm most of the time. We take our time to estimate the amount of work it will take to complete your job so you are not surprised at the end of the work. Seattle Bamboo is unique as we often trade a portion of our fees for bamboo plants that we thin from your gardens. We love bamboo, to us the life and vibrancy of this plant is both engaging and mysterious. This love shows in our work and our main interest is in the health of your bamboo. Often, however, bamboo is not a good choice for your small garden.